Voodoo Banshee was and is 3Dfx's second 2D-3D combination chipset. It follows in the footsteps of the not-too-successful Voodoo Rush, but offers Voodoo 2 level performance on the 3D side instead of the sub-Voodoo Graphics (Voodoo 1) power of the old Rush cards. Diamond's Banshee board is called the Monster Fusion. I checked out the AGP version - there's also a PCI incarnation of the board. Having recently reviewed Diamond's V550, powered by NVidia's all-conquering Riva TNT chipset, I was interested to see what you get if you drop about $100 less and go for slightly older technology. The Monster Fusion retails for around $350 (Australian dollars), while the V550 costs $460 or so. 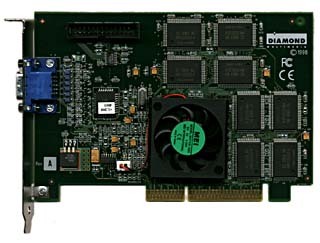 Many 3Dfx graphics cards are, essentially, just minor reworkings of the 3Dfx reference design, and this one's no exception. Instead of the common slower SDRAM, Diamond have chosen to use SGRAM (Synchronous Graphics Random Access Memory) for the 16 megabytes of onboard memory, which makes the card rather faster for 2D, not that the difference really matters. The other chief point of interest is the fan-cooled heatsink on the main chip; the ultra-low-profile fan is built into the heatsink, and the whole assembly is no bigger than the standard "prickly" heatsinks included on boards like the Viper V550 (reviewed here). This means the Monster Fusion will definitely not foul any other cards in your computer, which is a good thing. The big fan I added to my Viper (read how here) makes it impossible to mount a card next to it. The presence of the fan makes the heatsink itself pretty much fin-free, and so the whole assembly doesn't do nearly as good a job of keeping the chip cool as a "full size" fan and sink combo. After only a half hour benchmarking session with the computer case open, the other side of the board under the heatsink was almost uncomfortably hot. This was on a hot Sydney night, but just the same - don't get the idea that this cooling system is so great that you can overclock without a care. You couldn't go all that far overclocking this card, anyway, because it's already clocked higher than most Banshee boards. Core speed is 115MHz, memory speed is 125MHz, versus 100 to 110MHz and 115MHz respectively for competing Banshee boards. Even conservatively clocked boards can only be made about 10% faster by overclocking, so you've got to be something of a loony to bother; the Monster Fusion is already on the redline. If you insist on twiddling further, the utility to use is Powerstrip, free from EnTech. Diamond as usual provide only a CD-insert-sized booklet on installing the Monster Fusion - the box is big enough for the complete works of Shakespeare, but, again as usual, contains mainly fresh air. The booklet covers Windows 95, 98 and NT installation well enough. Novices might be annoyed that there aren't any illustrations, but if you've installed a card before this is no big deal. I ignored the provided driver CD and downloaded the most recent drivers from http://www.diamondmm.com/products/drivers/driver-index.html prior to installing the card. I recommend you do the same, as a matter of course, with any new hardware. The drivers in the box generally work just fine, but it seldom hurts to start with the most current ones. The driver includes the usual 3D quality options and gamma correction control, but no clock speed slider. Some people have complained about this. As I note above, they are nuts. When installing an AGP graphics card, even if you're replacing another AGP card, it's a good idea to set your video driver back to standard VGA (the very first option of the very first entry in the full Windows video driver list). If you're upgrading from a PCI video card and you don't do this, your machine will probably just beep at you sadly when you restart it with the new card in place. If you're swapping one AGP card for another, you may or may not have problems. I winged it when swapping the Monster Fusion in place of the Viper V550 and just left the Viper driver in place, and the card swap went smoothly - but when I swapped back, the Fusion drivers didn't like the Viper at all and I had to restart in Safe Mode, switch to VGA and restart again, because the Viper driver installer won't run in Safe Mode. Save yourself the aggravation - do like the docs say, and switch to VGA before installing. If your computer allows you to set your AGP bus speed faster than 66MHz, and you've done it, set it back to the default speed before installing the new video card, or more confusing beeps will greet you. And if you're running a Super 7 motherboard, remember that your AGP port probably won't work unless you've got USB drivers installed. This can also apply to some Slot 1 motherboards, like for example the Abit BH6. Don't ask why, just do it. The driver install package also contains Diamond's InControl Tools, which provides quick menu access to various Windows display features as well as resolution switching like the venerable QuickRes or rather better MultiRes (another free EnTech product). In its 2D performance the Monster Fusion tests pretty much exactly as fast as the V550 for business purposes - in other words, a great deal faster than anybody is likely to need. The SGRAM lets it streak ahead in DirectDraw tests, which might matter if you're into baroquely complex ultra-high-resolution CAD applications or something. 2D speed hasn't really been a factor in video card choice for a couple of years, now; it's resolution and refresh rate that counts. In this department, the V550 has an edge, but not a giant one.The Monster Fusion can maintain an 85Hz refresh rate all the way up to 1600 by 1200 pixels in 24 bit; it supports 1920x1440, but only at 60Hz. The V550 does 85Hz or better all the way to 1920 by 1200. This is not an issue for most users, because most monitors don't handle higher resolutions than 1280 by 1024 or so. Even if your shiny new 17 or 19 inch monitor does accept humungous resolutions, they're not much use for anything but games - see the sidebar. The Banshee's 3D electronics are much the same as the Voodoo 2's, except it doesn't have multitexturing - which makes it a bit slower for games that support multitexturing, like Quake 2 and Unreal. On the other hand, Banshee supports 1024 by 768 and even 1280 by 1024 in 3D, rather than the 800 by 600 you're stuck with if you use a single Voodoo 2 - you need twin Voodoo 2 cards in Scan Line Interleave mode for 1024 by 768. So how fast is it? Well, to be honest, it ain't that exciting. On my 450MHz overclocked Celeron 300A, a processor perfectly equal to a Pentium II 450 for gaming (and, indeed, pretty much all other) purposes, the Monster Fusion's Quake II performance was lacklustre. Even in 640 by 480 resolution it only managed 21.3 frames per second on the Crusher demo, which reflects worst-case-situation multiplayer game speed. Its performance on the standard Demo2 and less demanding multiplayer test Massive1 was acceptable, but to pass muster for multiplayer gaming you need to manage about 30 frames per second on the Crusher demo. Who cares how fast the card is when you're just running down a corridor - it's when everyone's shooting at once that you really need the frame rate. The Viper V550, whose Riva TNT chipset revels in monstrous CPU power and which, I remind you, supports multitexturing, was almost 40% faster on the Crusher demo in 1024 by 768 mode than the Monster Fusion in 640 by 480. This represents about 3.5 times the pixel-pushing power. In contrast, Diamond's older Monster 3D II using the Voodoo 2 chipset and running in 640 by 480 can at least keep up with the TNT's 1024 by 768 framerate. That said, it's unfair to use only multitexture games to test a Banshee card. In games that don't use multitexturing, the Banshee is pretty much exactly as fast as a Voodoo 2. If you play your first person shooter in single player mode and you're happy with Voodoo 2-level 800 by 600 graphics, the Monster Fusion will do better than fine. If you're a flight simulator aficionado, 1024 by 768 will probably be quite acceptably speedy. 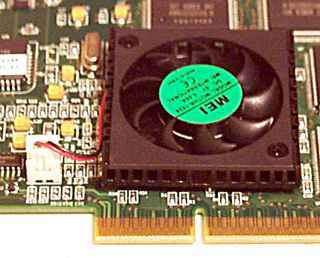 And you also have to remember that the Fusion supports 3Dfx's proprietary Glide 3D standard, which makes it highly compatible with a large number of games whose OpenGL or Direct3D support, for cards like the V550, may be dodgy or absent. The Monster Fusion works fine with Unreal, for instance (just as well, since it comes with it! ), while Unreal on TNT cards is, at the time of writing, still not working at all acceptably. The Monster Fusion comes with a "special edition" of Unreal, which like all special editions is basically just a demo. This is a pretty good one, though. It's got 11 levels, and three new deathmatch levels - only two are mentioned on the box. You also get the full version of Microsoft's Motocross Madness, a fun arcade dirtbike racing game which, I'm afraid, has no guns on the bikes and is therefore of no interest to me. If you've got a DVD drive without a hardware decoder board, you may also be glad of the included SoftDVD package, which on speedy machines (a paper insert included with the documentation warns you that SoftDVD will only work on Pentium II processors) can play DVD movies at very high quality - but only on your computer monitor, since the Monster Fusion has no TV output. 3Dfx aren't aiming the Banshee chipset at hard-core gamers, and indeed for the most popular 3D games even a fast Banshee board like the Monster Fusion isn't quite up there with Voodoo 2, let alone the Riva TNT. But that doesn't make this a slow, or a bad value, graphics card; it's plenty faster than Voodoo 1, it supports 1024x768 in 3D for simpler games, and its 2D performance is blistering. If you're in the market for a new video card and can't justify the extra dollars for TNT, the Monster Fusion is a fine compromise. A lot of video cards these days offer outrageous maximum output resolutions. Unless you spent several times as much on your monitor as you did on your computer, though, they're not likely to be good for anything but playing games. A monitor's dot pitch, or phosphor pitch, along with its size, determines how high a resolution it can clearly show, regardless of what resolutions its electronics will accept. Dot pitch is the distance between any given dot and the nearest dot of the same colour - red, green or blue. The smaller the dot pitch, the more pixels per inch the monitor can display without running the pixels together. This is the dot layout of a standard "shadow mask" monitor. Each displayed pixel must cover at least one red, one green and one blue dot - a "triad" - in order to be displayed correctly. Since the dots are arranged in equilateral triangles, any given triad is 0.866 of the dot pitch away from any other one, and so the theoretical maximum number of pixels per inch of a .28mm dot pitch monitor is about 105. Because of the way the rectangular pixels map onto the interlocking triads, though, you can only use about 75% of the apparent maximum resolution before the image gets fuzzy. So this .28mm dot pitch monitor can actually display about 79 pixels per inch. The canonical pixels-per-inch figure for monitors is 72, corresponding to a .31mm dot pitch. If you can only display 72 sharp pixels per inch, a "17 inch" monitor with a 12.5 by 9.25 inch viewable area is good for only 900 by 666 really sharp pixels. 800 by 600 will therefore look great, 1024 by 768 will probably be bearably clear and fine detail will be fuzzy if you use higher resolutions. A monitor with lower than .28mm dot pitch will do better. Sony's Trinitron monitors and some others use an aperture grille (lots of vertical wires) instead of the usual shadow mask, and so their pitch figures are not directly comparable with those for regular picture tubes. Refresh rate: It's not enough that a given graphics system support the resolution and colour depth you want. It must also do it at a reasonable refresh rate. Refresh rate, measured in Hertz (Hz), is the number of times per second the screen is "repainted" with the image. Refresh rates below about 72Hz cause visible flicker; higher rates don't. Different people have different thresholds of annoyance when it comes to screen flicker, but staring at a 60Hz screen all day is an unpleasant experience for pretty much anyone. In gaming, refresh rate is not so critical , because you're generally not staring intently at relatively stationary objects in great fields of solid colour. But you still want 75Hz or so, if you can get it. Super 7: The current fastest motherboards for traditional, socketed, Pentium-style chips like the AMD K6, as opposed to the Slot 1 Pentium II and Celeron.Super 7 motherboards offer all the features of Slot 1 motherboards, but with a socket instead of a slot. USB: Universal Serial Bus, the enormously useful newfangled interface for various low to medium speed devices like mouses and modems and scanners.